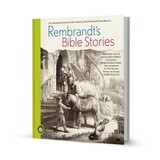 This book is also available in English: Rembrandt's Bible Stories. Birthday Calendar Rembrandt with his etchings. REPRO B28 The Fall of man, Adam and Eve, 1638. 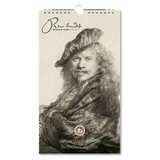 A sheet of 25 Rembrandt stickers. 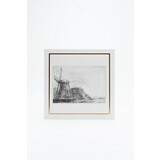 Greeting card Rembrandt etching with envelope. REPRO St. Jerome, true size. Abraham's sacrifice, 1655. Just as Abraham made to slay his son an angel came between the two. The image size is 15,6 x 13,1 cm. The return of the prodigal son, 1636. The son returned to his father after having squandered his money on loose living. He was joyfully welcomed home by him. The image size is 15,6 x 13,6 cm.